Welcome to the Earth Day Event! 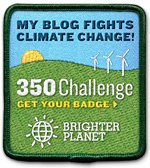 Over 60 Bloggers have joined up with Eco-friendly companies to give you free prizes! At Why We Love Green you can win Mama Cloth from Mama D's Closet and Mama Cloth Wash by Ruby's Red Wash! The grand prize is a Kindle Fire! Thank You for taking a part in the Earth Day Event and supporting eco-conscious living. This event is sponsored by Eco-Foil and co-hosted by Way 2 Good Life and She Promotes. There are so many companies out there that help the environment – why not to know more about them? Learn about great businesses, their products, and win some giveaways. Over 60 bloggers have prizes valued at $25+. Make sure to visit every blog for more chances to win. Eco-Foil provided Kindle Fire ($199 value) as a grand price. In order to win it – you need to enter some giveaways (the more you enter – the more entries you earn)! Take a moment – visit Eco-Foil and look for 100% recycled disposable aluminum pans at the local stores. Here at Why We Love Green you can win any 2 in-stock mama cloth pads from Mama D's Closet, a bottle of Ruby's Red Wash for removing menstrual stains, and a magazine subscription to Parents or Parenting Magazine (your choice)! One lucky runner-up will receive an 8 oz. bottle of Ruby's Red Wash as a 2nd Place Prize! Enter using the Rafflecopter form below!! Disclaimer: Please note that Way 2 Good Life, “Earth Day Giveaway Event” or the “Earth Day Event” bloggers are not responsible for sponsors that do not fulfill their prizes. We have represented each sponsor with the expectation they will fulfill their prize and in a timely manner. We will contact the sponsor regarding your prize(s). The sponsors, in most cases, are shipping their items to you directly. We will make every effort to assist you obtaining your prize. If there is an issue with a sponsor, please notify the blog you won a prize from within 4-6 weeks for assistance, after that we may be unable to assist you.